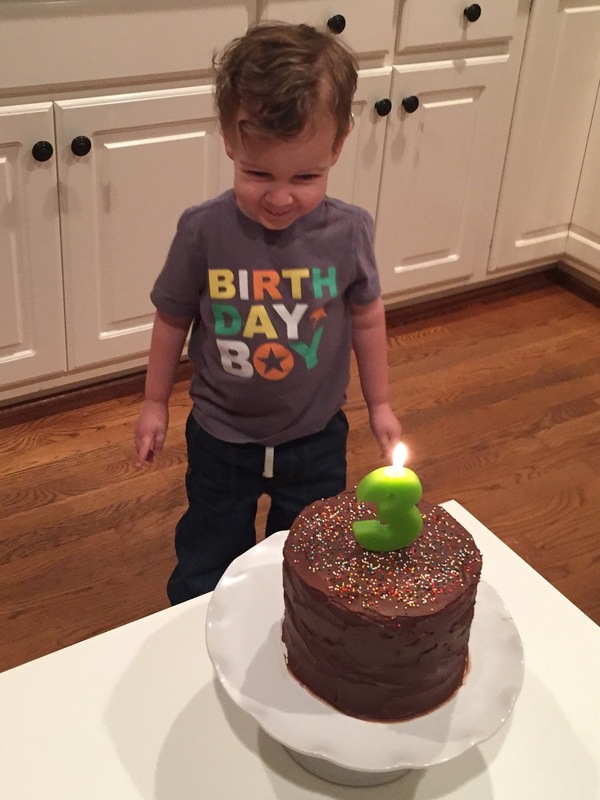 This year, I decided to do an interview to get a glimpse into three-year old Parker's life through his own words. He had a ball. He was all about the interview process. In fact, halfway through, he asked for the paper and pen and became the interviewer all on his own, asking me: What is your favorite coffee maker? I told him I like when Parker makes the Donut Shop coffee in the Keurig and he furrowed his brow and deliberately recorded my answer. He melts my heart. For the next couple days he would randomly ask (very excitedly) to do another interview. More questions! What do you like about the orchestra? I like the viola. And I like the cellos. And I like the double basses. And I like the oboe. And I like the clarinet. And I like the bassoon. Flute, oboe, clarinet, bassoon. What do you remember from this year? Parker's actual birthday this year started with Mommy and Daddy singing Happy Birthday and bringing in a birthday balloon! It was Max's off-Friday, so we got to spend the whole day as a family. Then we jumped in Pepper and road tripped to Chattanooga where we visited the Tennessee Aquarium. 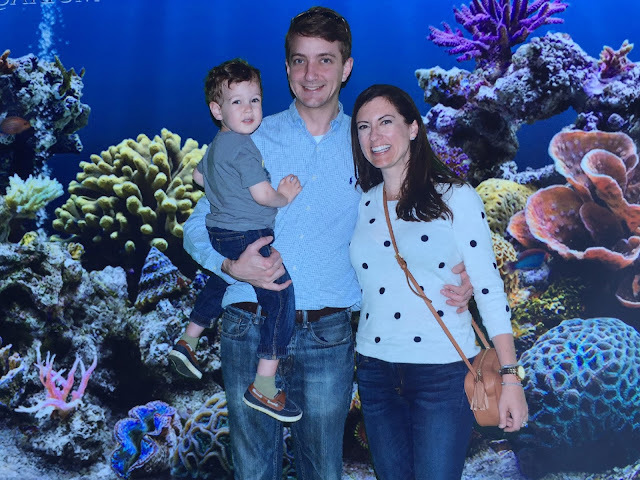 I grew up going to The Monterey Bay Aquarium so my standards are high, but I am actually equally impressed with the Tennessee Aquarium! No, it doesn't cycle in ocean water like Monterey's, but it does have a ton to see, including penguins, otters, jellyfish, sea horses and a ginormous tank with sharks - my favorite! Parker's takeaway message from this exhibit: Alligators eat people! We lunched in downtown Chattanooga (where the aquarium is located) then hit up the rest of the aquarium. It was the perfect birthday outing! By the time we rolled back into Huntsville it was almost dinnertime. Parker had been talking for months about going to I Heart Sushi for his birthday dinner, and we were happy to oblige. Little Man went to town when our meal arrived! Chopsticks for the win! And of course we ended the day with birthday cake - yellow with chocolate frosting, just like he was hoping for! Parker was all kinds of happy. Awwww, this is soooooo cute! Aw, I love his interview. I especially love that he'd spend his million dollars on pears. Sounds like such a fun birthday. Great shot of the three of you at the aquarium! Such a sweet interview! I love reading these! And the aquarium is always so much fun! Sounds like the perfect birthday celebration! I love that you did a little interview too :) He will love looking back at his answers when he's older! BEST Mommy and Daddy ever! !